There are many customer relationship-management software options for your business. There’s the tried and true, Salesforce.com, then there’s Zoho and SAP, Microsoft Dynamics, Oracle, Infusionsoft, SugarCRM, Sage…I think you get the point. Despite the plethora of options available, there’s still something left to be desired in each CRM. You know this, I know this and HubSpot definitely knows this. That’s why they’ve developed and launched a new CRM software that fits right into their already effective marketing automation platform and CMS. The HubSpot CRM is not as robust as market leader Salesforce, but it does include many features current business-development representatives have been dreaming of. As with any new software, there are a number of factors to consider regarding whether to migrate to the HubSpot CRM or whether HubSpot will be your company's first CRM. In today’s post, we’ll cover a few key pros and cons you should consider before migrating to the HubSpot CRM. Full disclosure: New Breed is a customer of Salesforce and uses the HubSpot CRM as an overlay onto Salesforce for our business-development and account teams, while our leadership team still leverages the more robust reporting available in Salesforce itself. What CRM do you use and why? 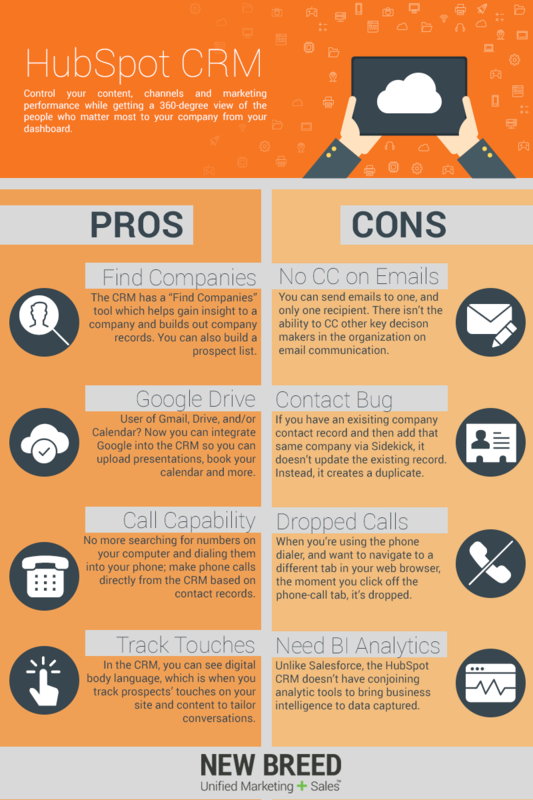 Would you ever consider making the switch to the HubSpot CRM? Let us know in the comments below!